There is nothing more heartbreaking than buying the swimsuit you love only to try it on at home and find out it’s a little too big in the top. But don’t ditch the suit yet; try this top-cinching idea first. Try your swimsuit on and examine your reflection in a full-length mirror. Reach behind the swimsuit and gather the right and left shoulder straps in one hand. This will pull the swimsuit closer to your bust area. Move your hand up and down the straps. This will take in different areas of the top of your swimsuit. Stop when you find the spot that makes the front of your suit fit well. Open the safety pin in your other hand and pin the two shoulder straps together. Move around as you might when you are normally wearing a swimsuit. Stretch your arms over your head, then lower them down to touch your toes. Watch all of these movements in the mirror. If you see the suit gaping or bunching, or if it seems too restrictive in some places, adjust the position of the safety pin. Remove the suit when you are satisfied with the fit. 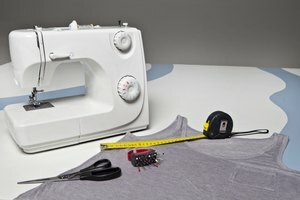 Thread your sewing machine with thread the same color as your suit. If your suit is multicolored, chose a color to match the most dominant color in your suit. Replace the safety pin with a straight pin. Place the swimsuit straps under the sewing machine presser foot, stretching them slightly. Lower the presser foot onto the straps and remove the straight pin. Sew the edges of the two straps together in the zigzag stitch where they overlap for about 2 inches. Continue to stretch the straps slightly as you sew. Trim the thread ends and enjoy wearing your custom-fit swimsuit. Have a friend safety pin the suit in place when you are trying to get the right fit.